Hey everyone! Welcome to a new challenge at Do You Stack Up?! Last week Red was king. This week we want to go to the other side and play with cool colors. They can be soft or a little brighter, just whatever motivates you. Here is my card using a Copic Marker Scrapbooking image. LOVE the paper pieced balloon Joan!! Fabulous!!! Love the soft pastel colours on this gorgeous card. this is so ethereal! i love how you've used the colors. beautiful! joan - what a fantastic card! i love the baloon. great paper piecing and color choices! 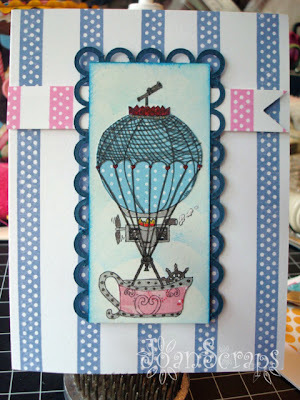 Oh I LOVE the paper pieced balloon! This card is so pretty!